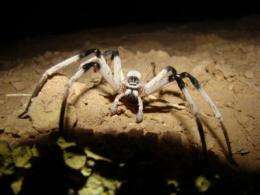 A new and previously unknown species of spider has been discovered in the dune of the Sands of Samar in the southern Arava region by a team of scientists from the Department of Biology in the University of Haifa-Oranim. Unfortunately, however, its habitat is endangered. "The discovery of this new spider illustrates our obligation to preserve the dune," says Dr. Shanas, who headed the team of scientists. During a course of studies that Dr. Shanas's research team has carried out in the region, they discovered this new spider, a member of the Cerbalus genus. Since it has been found in the Arava, it has been given the name Cerbalus aravensis. 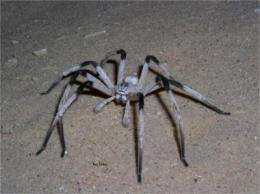 The researchers say that this spider's leg-span can reach up to 14 cm., which makes it the largest spider of its type in the Middle East. 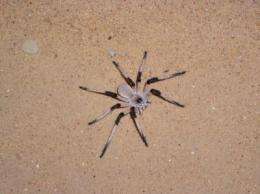 Even though details are still lacking to enable a full analysis of its biology and of its population in the sands, the scientists know that this is a nocturnal spider, mostly active in the hottest months of the year, and that it constructs an underground den which is closed with a "lifting door" made of sand particles that are glued together to camouflage the den. The scientists' excitement is indeed mixed with apprehension. According to Dr. Shanas, the Israel Land Administration intends to renew mining projects in the Sands of Samar in the near future, which will endanger the existence of the newly discovered spider. He adds that it is possible that there are additional unknown animal species living in the sands, and therefore efforts should be made to preserve this unique region in the Arava. "The new discovery shows how much we still have to investigate, and that there are likely to be many more species that are unknown to us. If we do not preserve the few habitats that remain for these species, they will become extinct before we can even discover them," Dr. Shanas concludes. on the other hand, if it's that hard to find, then maybe it's also that hard to find somewhere else and this area is not particularly important to it's survival as a species. Im wondering if this is another one of those "new" species, already known to the locals. This is a pretty big spider. Hard to miss if you live in the desert.